The Paukan 2007 operates out of Myanmar (Burma) located in Southeast Asia. 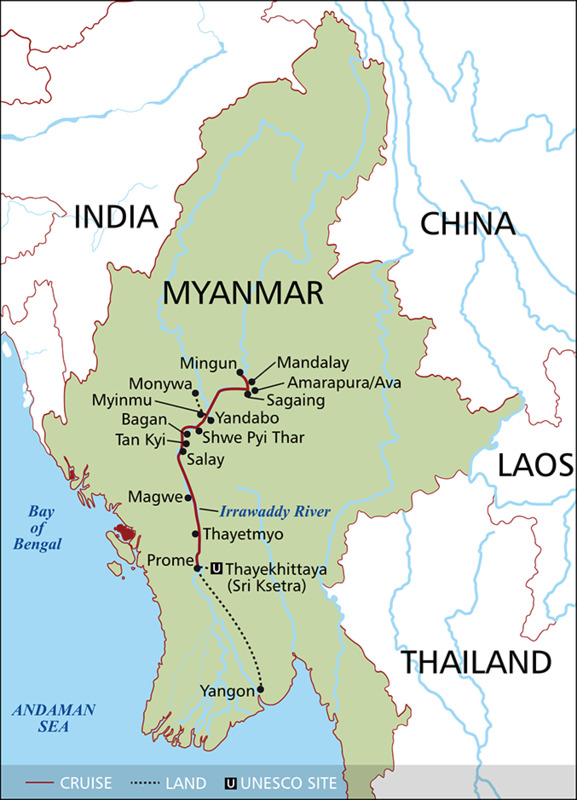 Myanmar (Burma) has international airports located in Mandalay (MDL) and Yangon (RGN). There are multiple flights daily to/from Mandalay (MDL) or Yangon (RGN) airports. All domestic flights are operated by local airlines. These tickets are issued by local airline agents. There are multiple local flights daily from Mandalay (MDL) or Yangon (RGN) to Bagan (NYU) - Nyaung U Airport. The Paukan 2012 runs on a specific schedule, check with your Travel Specialist for recommended flight information. Embarkation and disembarkation depend on the selected itinerary. Review the specific itinerary with your Travel Specalist to find the correct embarkation or disembarkation point. *No specific address but know to all local people. Transfers to/from airports, hotels or ships are not included, as well as domestic airfare. However, these services can be arranged for an additional fee. A single-entry visa is required for all foreign citizens traveling to Myanmar before entry. More information about obtaining a tourist visa can be found by Contacting us, your local embassy, or your preferred travel visa service.